The Cold War is often used to demonstrate several aspects of game theory, such as playing chicken, mutually assured destruction, and the Prisoner’s Dilemma. Circumstances have changed since the USSR fell in 1991, but many of these applications still hold. Tyler Cowen, a professor of economics at George Mason and founder of the blog Marginal Revolution, has a great piece in the New York Times recasting that game theory on the situation in Ukraine. We can view a number of aspects of Russia’s aggressive stance in Crimea – and the international response – through the prism of game theory. For one, following a 1994 agreement aimed at centralizing the world’s nuclear supply, Ukraine handed over its stockpile of nuclear weapons to Russia. In return, it received assurances from said country that its borders would remain intact. 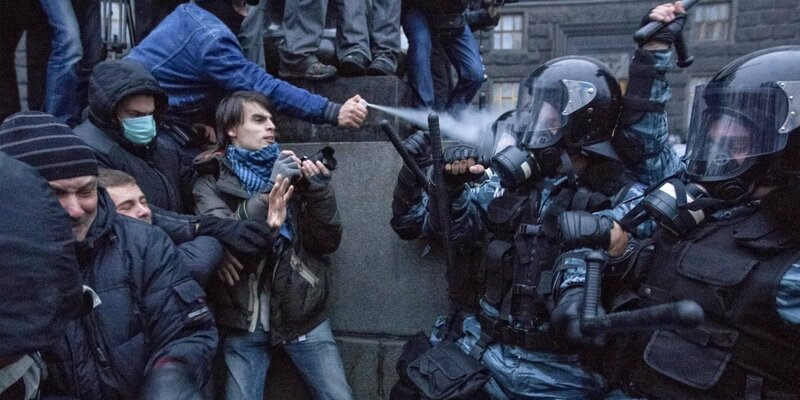 Protestors in Kiev, November 2013. Reuters/Valentyn Oglrenko. Russia’s breaking of this deal harks back to the concept of mutually assured destruction. In short, if two countries have nuclear arms, neither will nuke (or perhaps even attack) the other, since the only real response is to drop a nuke in return, and then the whole world falls apart. (If you’re unfamiliar with this, watch Fail-Safe.) Of course, this only works if both countries have nuclear weapons with which to threaten each other, and Ukraine shipped its last holdings to Moscow in 1996. Professor Cowen makes a number of other points, and his piece is an enlightening read. One he misses, however, is a movement towards docility in international relations, particularly from the United States. In the past, an American president might have given a strongly-worded condemnation of Russia’s takeover of Crimea (and areas beyond), perhaps followed by military action (look at the Cuban quarantine). Yet Obama, perhaps realizing he can’t do too much in response without risking retaliation, has been reduced to a few mealy-mouthed quasi-repudiations of Russia’s actions. And it’s not just with Russia: with Syria and with Egypt, to name but two, the response to an effective coup d’état from the supposed lone superpower has been underwhelming. (We did step in with Libya, but that was an exception.) If Russia sees that its chief rival won’t intervene in smaller countries, why would it expect interference in its own affairs? For an overview of the basics of this fascinating academic field, visit my Guide to Game Theory.